According to the Office of Mosquito Control Coordination in the state Department of Environmental Protection, a number of mosquitoes have tested positive for West Nile virus. This is not unusual; especially as the summer progresses, rains and heat combine to create nesting pools for mosquitoes to propagate. The West Nile virus, eastern equine encephalitis, and St. Louis encephalitis carried by some New Jersey mosquitoes can cause high fevers, brain swelling and meningitis. Thus far, there have not been any cases reported this summer. The Office of Mosquito Control Coordination reported that mosquito pools in six counties have tested positive for West Nile, primarily in the Northwestern regions of New Jersey. Typically, such cases occur sometime in later August, early September. The Department of Environmental Protection is providing increased resources to county mosquito commissions throughout New Jersey – including $500,000 in grants for mosquito control expenditures, more than 20,000 mosquito dunks and traps, and more than 500,000 mosquito larvae-eating fish – to aggressively combat the threat of Zika and other mosquito-borne diseases. The median home sale price increased 7.3% to $298,000 in June 2017 compared to June 2016. The continued limits placed upon the markets by the national inventory shortage and the rising home prices is reflected in the reduced increase of home sales of 1.9% compared to 2016. For the month, June had a 2.5-month supply of homes- which is the lowest Redfin has recorded since it began tracking the market in 2010. According to prior industry standards, this marks a significant difference from the accepted standard of 6 months prior to the past 18 months. To further highlight the problematic issue of inventory scarcity, San Jose and Seattle each had less than a one-month supply of homes. The number of homes for sale fell 10.7%, marking the seventh straight month of double-digit, year-over-year declines. On a year-to-year comparative basis, there was no change in the number of homes newly listed for sale in June 2017. 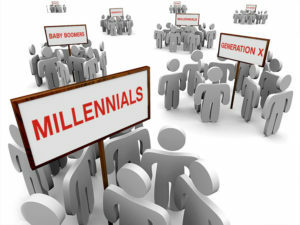 For many of us in sales, we understand what it takes to market to the Baby Boomer generation, and even to some degree to the Millennials; but now there are Centennials and Generation X’s. It comes down to one word: adapt! Marketers are learning to effectively segment their communication targeting every age group based upon their buying habits, which is primarily due to the impact of technology. The older generations tend to put price, selection and convenience above all else, while the younger shoppers want personalized, cross-channel experiences. Here are some ways to approach each group with a greater degree of effectiveness. ■ 36% of all consumers have opened separate email accounts solely for brand communication. ■ 58% of all Millennials have opened separate email accounts solely for brand communication. ■ 26% of all Baby Boomers have opened separate email accounts solely for brand communication. ■ 79% of Millennials are more likely than any generation to have made a purchase on Amazon in the last 30 days. ■ 69% of Generation X have made a purchase on Amazon in the last 30 days. ■ Baby Boomers are spending less as they retire. ■ Generation X is more financially powerful. ■ Millennials are now building careers and families. ■ 80% of Centennials say social media influences their shopping. ■ 74% of Millennials say social media influences their shopping. ■ 58% of Generation X say social media influences their shopping. ■ 41% of Baby Boomers say social media influences their shopping. Prefer brands that offer wide selections at discounted prices. Not motivated by loyalty programs or unique brand experiences, this generation wants to see a variety of well-priced products that meet their immediate needs. ■ For most Boomers, price (62%) is the biggest selling point. ■ For many Boomers, convenience (36%) influenced recent purchases. ■ For Baby Boomers, they are least likely to buy gifts for others around the holidays. ■ For Baby Boomers, direct mail and email are a preferred methods of communication (59%). Want good buys on quality products, as well as a convenient path to purchase. ■ Gen Xers place highest value on price (55%), followed by quality (45%) and convenience (23%). ■ 85% of Generation Xers say that discounts influenced their last purchase. ■ 36% of Generation Xers are likely to be bargain hunters when shopping for others. ■ 59% of Generation Xers value email. Millennials like to stick with a brand once they are satisfied with the product or service. ■ 22% of Millennials are likely to remain loyal to a brand because of its loyalty rewards. ■ 34% of Millennials describe themselves as quality-first shoppers. ■ 67% of Millennials are likely to find email and mobile apps (61%) important to making a purchase decision. CENTENNIALS (under the age of 21): This group of shoppers wants authentic brand experiences across all channels. They are true original digital natives, and still expect personalized interactions with brands that understand their needs. ■ 57% of Centennials say quality drives their loyalty to a brand more than any other factor. ■ 50% of Centennials based their last purchase decision on product quality. ■ 59% of Centennials were influenced by free shipping. ■ Centennials prefer to find customized gifts for everyone they know (35%) rather than hunt for bargains or make decisions based on convenience. Over the last few years the anomaly of low inventory has become a staple of the topography of the real estate market. Now there is another factor complicating this conspiracy of constriction: labor shortages within the construction industry. According to a current report put out by the U.S. Chamber of Commerce, contractors are having to turn down work! Turning it down!!! That is not all; over half of them are putting in higher bids to cover increased labor costs. The labor shortage is hitting just about everyone: two-thirds of the contractors are grappling with labor shortages, making jobs more expensive and harder to finish on deadlines. So the pressures that companies are facing are forcing the employers to require more productivity out of their current work forces. There is no assembly line in construction; it used to be feast or famine, but now it’s feast, famine or shortage. According to the studies, the shortages are most noticeable in concrete, interior finishes, masonry, electrical and plumbing. For the larger firms, there is great concern over the possibility of having to turn down some handsome projects that are being proposed by the Trump administration. According to some, this bonanza could total one trillion in government spending. 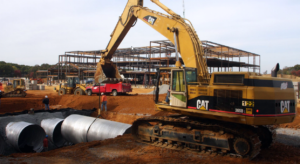 According to the U.S. Census Bureau, for the first four months of this year, construction spending amounted to $359.5 billion, 5.8% more than the same period in 2016. So as the labor shortages are squeezing the ability of builders to provide needed new housing, the inventory factors are only making the demand drive prices higher than many first-time home buyers are willing or able to cover. In New Jersey, for the month of May 2016, there were just over 39K homes for sale on the market. Compare this withj the 57K that were listed back in May 2011. This represents a reduction of 46%. This contracted market is also seeing buyer demand on a record pace, with over 7,329 closed sales in May 2017 as compared with just 3,916 closed sales for May 2011. And back in May 2011, the average number of days on the market before sale was 135; compare this with the 70 days on the market for May 2017, nearly a 50% decrease. Still, new listings in May 2017 are drawing new sellers out of the woodwork with over 14K listed on the market. This all points to a healthy, robust market for the real estate industry, without the artificial stimulants that were available back in 2004-7. Counsellors Title Agency, www.counsellorstitle.net, founded in 1996, is one of New Jersey’s most respected title agencies, serving all 21 New Jersey counties with title insurance, clearing title, escrow, tidelands searches, and closing and settlement services for commercial or industrial properties, waterfront properties and marinas, condominiums, townhouses or residential single family homes. Counsellors Title also features its own Attorney Settlement Assistance Program™ [ASAP], which is an individual resource customized to fit the needs specifically of real estate attorneys, including Documentation, Preparation, Disbursement of Funds, Attendance at Closing, HUD Preparation or Post-Closing Matters. The experts say that housing inventory is tight. This is true, but this uses what used to be as the benchmark for what is now. Houses are still selling, and selling faster than ever before. The good thing is that the economy is not overheated, interest rates aren’t ridiculously low, and no one is giving anything away. That all makes for a very healthy market. So if you are looking to buy, don’t give up. 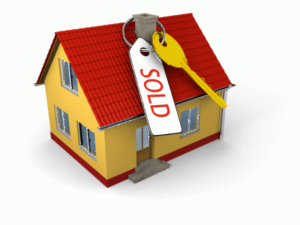 Once you find a house you want to purchase, that process of purchasing a home can take up to 45 days. But how much time it will take to find and agree on a house to buy takes months usually. In some cases, it can take over a year, depending upon where you are buying a property. And currently, prices have risen so much that homeowners are not able to trade up and others are simply waiting for their house to get into positive equity territory. Know Your Market: Not all markets are the same; some are too hot to handle, and others are just moving along. If you have kids, the clock is ticking if you want to get your kids into the school of your choice. But if you have the luxury of shopping for exactly what you want, there is still plenty of time to buy in 2017. The real estate market is strong until the week before Thanksgiving. In some cases there is a surplus and for other locations close to public transportation, the competition is stiff. Have Your Mortgage Pre-Approved: Every serious buyer is ready to pull the trigger. Make sure your agent has all your paperwork. Be Specific With Your Feature List: Getting the right house in the right location can be a matter of knowing the difference between your must-haves, and your can have later. Pay If the Price Is Right: In a low inventory market as is the case today, you want to be decisive. Your agent can help you if you are tentative. If the house is in your price range, and you are getting most of your features, it is a pretty good chance that this is a good call; especially if it is in a desirable neighborhood. 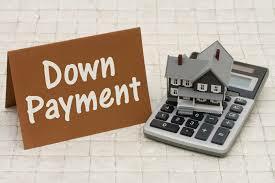 A No-Nonsense Down Payment: If you find “the house,” your down payment says a lot. Today, a serious down payment is in the range of $5,000. Your Offer Letter: Buying and selling a house is more than a transaction: it represents a changing of the guard. For the person buying the house, it is a dream realized. And often for the seller, it is a mantle passed on. Many houses have histories that live long after the residents move away. Make sure your offer letter carries your vision for the house. Don’t fill the offer letter with a bunch of criteria and contingencies. The number of borrowers ‘underwater’ fell in the first quarter of 2017 to 1.8 million borrowers. This represents a drop of 35% since this time in 2016, and a reduction of 16% in just the first quarter of 2017 alone. Considering that the spring buying season is historically the strongest of the four quarters, many experts anticipate that as the appreciation of home values continues for the balance of 2017, this figure of 1.8 million underwater will fall by possibly another 8% or 150,000 mortgage holders. According to the Black Knight Mortgage Monitor report, homeowner equity increased by $695 billion over the last 12 months, increasing to just under $5 trillion as of the end of Q1 2017. This marks the first time that underwater population has fallen below 2 million since 2006. This number is still significantly above the low mark of 750,000 borrowers who were underwater at the end of 2005, according to Black Knight. Home equity is an asset that comes from a homeowner’s interest in a home or, to put it another way, home equity is the portion of your property that you truly own. 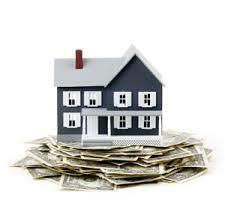 Many people take advantage of the equity in their home by borrowing against it for repairs or home improvements. A home equity line of credit (HELOC) allows you to borrow funds based upon the equity in your home, much in the same way as a credit card except you are borrowing against yourself. After a number of years, your draw period ends, and you’ll go into a repayment period where you pay off the amount of the debt. The state issued 23,000 permits last year for new residential construction, according to data from the Department of Community Affairs. That’s up from 19,000 the year before. These are the municipalities that had the most new homes started in 2016. 1. Jersey City, Hudson County issued 3,174 permits in 2016. 2. Lakewood, Ocean County had 710 permits issued in 2016. 3. Elizabeth, Union County had 674 permits issued in 2016. 4. Fort Lee, Bergen County had 667 permits issued in 2016. 5. Secaucus, Hudson County had 636 permits issued in 2016. 6. Aberdeen, Monmouth County developers received 594 permits in 2016. 7. Weehawken, Hudson County had 558 permits issued in 2016. 8. Harrison, Hudson County had 456 permits issued in 2016. 9. Toms River, Ocean County received 442 permits in 2016. 10. Franklin, Somerset County issued 432 permits in 2016. 11. Woodbridge, Middlesex County issued 386 new home permits in 2016. 12. Monroe, Middlesex County received 351 permits in 2016. 13. Jackson, Ocean County had 292 permits issued in 2016. 14. Absecon, Atlantic County issued 279 new housing permits in 2016. 15. Cliffside Park, Bergen County issued 254 permits in 2016. 16. East Orange, Essex County issued 250 permits in 2016. 17. South Brunswick, Middlesex County had 230 permits issued. 18. Morristown, Morris County issued 225 permits issued in 2016. 19. Lyndhurst, Bergen County had 222 permits issued in 2016. 20. West New York, Hudson County received 219 permits in 2016. New Jersey bucked the national trend of falling pending home sales by recording a high for May 2017. The National Association of Realtors [NAR] reported that pending home sales fell nationally in May for the third straight month. Even though none of the regions covered by the NAR showed an increase, not all the regions were equally impacted. The Pending Home Sales Index decreased 0.8% to 108.5 in May from a downwardly revised 109.4 in April 2017. He sees this as very possibly a stall in the trend. This is not the case in New Jersey. For May 2017, New Jersey’s pending home sales hit a record high: 9,011. 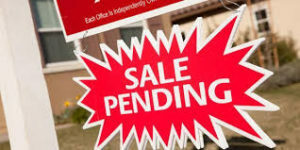 This figure is approximately 1,300 more pending sales than were recorded in April. Back in March of 2017, New Jersey recorded 8,335 in pending home sales. If we compare the numbers being reported for New Jersey, the numbers might be pointing to the ripple effect developing because of its proximity to New York City, where even the five boroughs are becoming middle class resistant. According to the figures supplied by New Jersey Realtor, pending home sales for single family houses came in at 3,256 back in September 2011 (the furthest back that numbers were supplied). And for comparative purposes, a year later, in September 2012, pending home sales for single family houses were only 3,834. As the market recovered from the real estate crash of 2008, by May 2015 the number of pending home sales for single family houses had climbed back to 7,073. And as previously stated, New Jersey’s pending home sales for single family houses hit 9,011. It seems that for once, New Jersey’s recovery, as documented by the numbers reported by the NJ Realtor site, points to a very healthy real estate market. Hopefully this year the final numbers will bring many of the counties of the Garden State back into range of the levels that it had seen back in 2006. 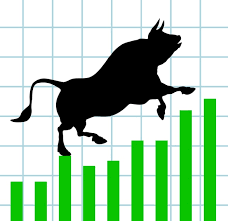 Home Prices: Is Real Estate in a Bull Rally? People want to buy homes. The fact that across the nation, the paucity of inventory of available homes for sale is doing very little to dissuade the buyers. The result: home prices have hit another peak nationally according to CoreLogic. CoreLogic reported this week that on a national yearly basis, home prices increased again in May from the prior month and from 2016 levels. ■ Long-term, it provides an extra cushion further down the road should there be a disruption in your cash flow. ■ Lenders see a 20% down payment as a better credit risk. ■ The 20% you put down helps to define you as a serious buyer, and in this market, serious is the name of the game. ■ With a 20% down payment, you can often get a lower interest rate. ■ With a 20% down payment, many lenders will not require you to purchase private mortgage insurance (PMI), which protects the lender against non-payment in the event of a default. ■ The 20% immediately becomes home equity in your property, which will allow you to borrow against it for such things as home improvements. 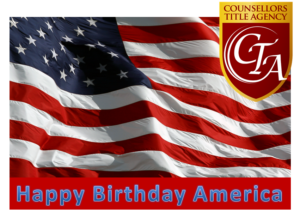 We wish all of our friends and clients a fantastic, safe and happy 4th of July.